I made the monumental decision to go gray. I have colored my hair since my 40th birthday. Increasingly, I disliked the 2 hours out of my day that it took to color it, although I always liked the results afterwards. Then, back in February, I got my usual haircut and realized I had about 4 inches of gray hair and it really didn't look that bad. It struck me that I could go completely gray and be very happy with the result. There is the ongoing rhetorical debate about how a guy can go gray and look distinguished while a woman goes gray in the same time frame and looks old. Gray is who I am and I have decided to embrace who I am which means embracing my gray hair. My stylist says I'll be gray by Christmas. I think it might be sooner, but we'll see. 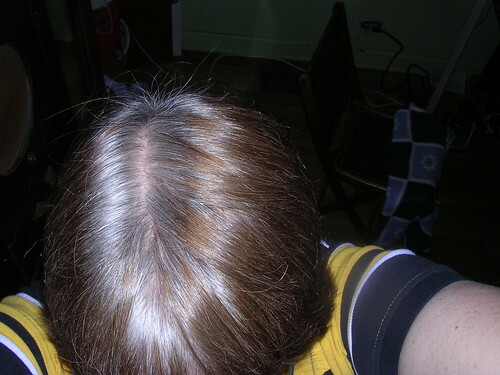 So, once a month, I will post a photo of my hair with the current gray visible. We'll call this gray watch and we'll see just how long it takes to grow out the faded brown into the silver gray. Right now, I have an inch of gray. No tea for this post: Dr. Pepper.